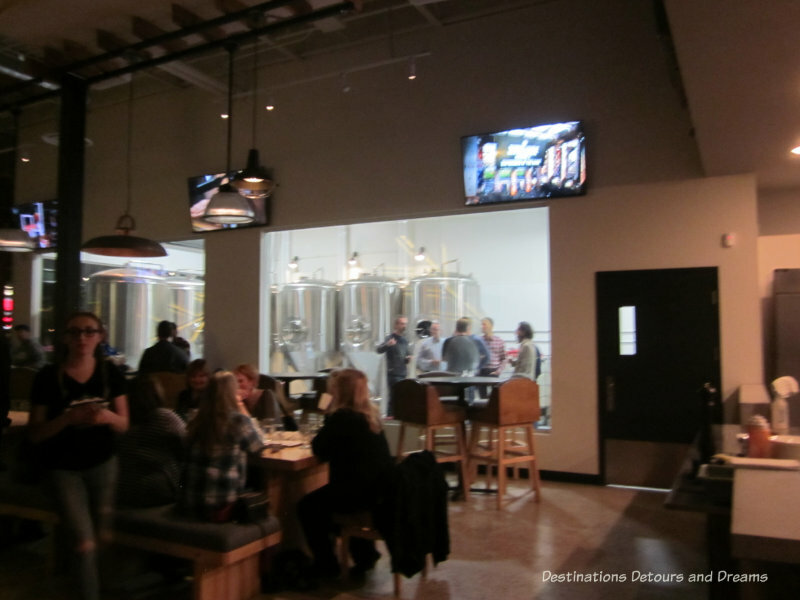 Although the craft beer scene in Winnipeg, Manitoba is only a couple of years old, there are now several microbreweries or brewpubs in the city. 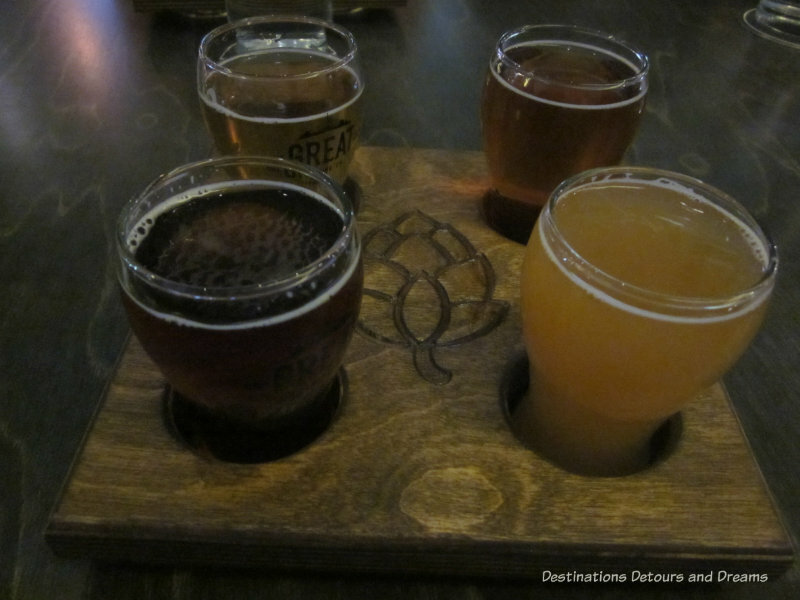 I visited three on the Ale Trail tour offered by Winnipeg Trolley Company: Little Brown Jug, Torque Brewing, and One Great City Brewing Company. Located at the edge of Winnipeg’s historic Exchange District, the building Little Brown Jug occupies was once the livery stables for City Hall. Since then, the site was home to the Red River Motor Coach Lines in the 1920s, a wallpaper shop, and a print shop. Renovations were done with the intention to leave original structures in place or re-use when possible. The roof was insulated from the top to allow timber beams in the ceiling to remain visible. 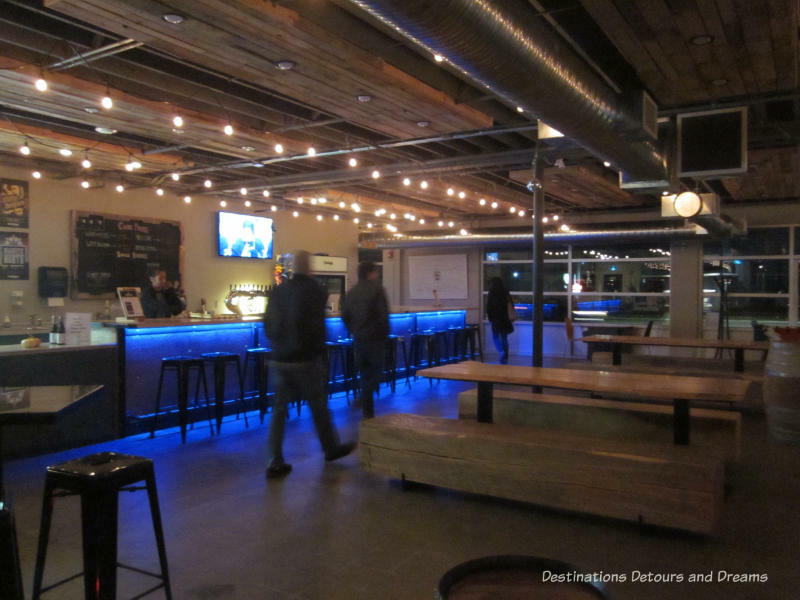 The counter and benches were made from 100-year-old Douglas Fir boards found hanging between steel trusses. The tasting area and brewery are both part of one large, open space. Tasters can watch the brewing process. Little Brown Jug makes only one beer. 1919 is a Belgian pale ale made using traditional German double-fermentation techniques. Although 1919 is their only regular product, sometimes on Fridays, they have a small batch of a special one-time beer the brewmaster has made. Throughout October, they had a beer on tap which had honey from Beeproject Apiaries as an ingredient. Beeproject Apairies maintain bee hives on rooftops in the Exchange District. While at Little Brown Jug, our tour guide gave us a lesson in beer tasting, which involved examining the colour in the glass, swirling the glass to pull out the aromas, taking a first quick sniff and then two sniffs with the glass near the nose, and finally sipping. 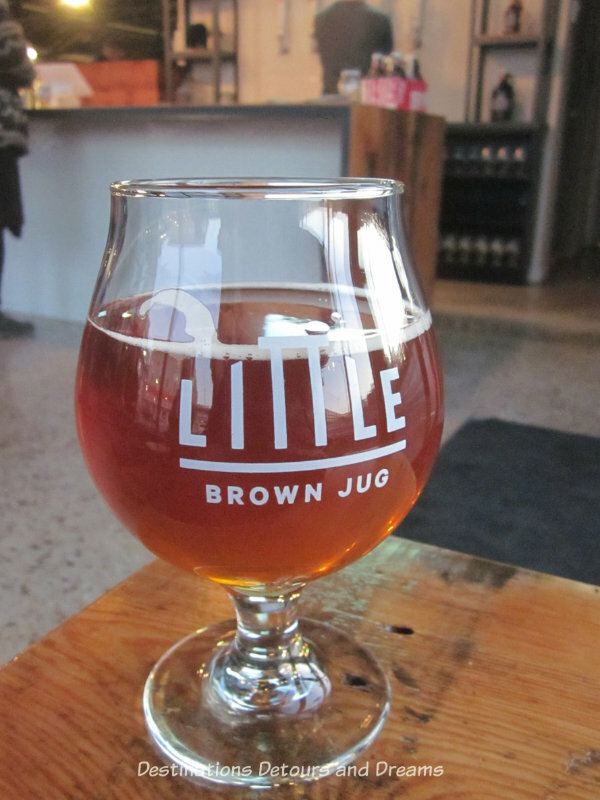 Little Brown Jug describes its beer as having a spicy and herbal aroma, but many of us detected a hint of citrus. The beer has a low bitterness level. The Little Brown Jug is open Tuesdays through Thursdays from noon to 9 pm, Fridays and Saturdays from noon to 11 pm, and Sundays from noon to 5 pm. Food is not served. 1919 is also available at Manitoba liquor stores and in some city restaurants and pubs. 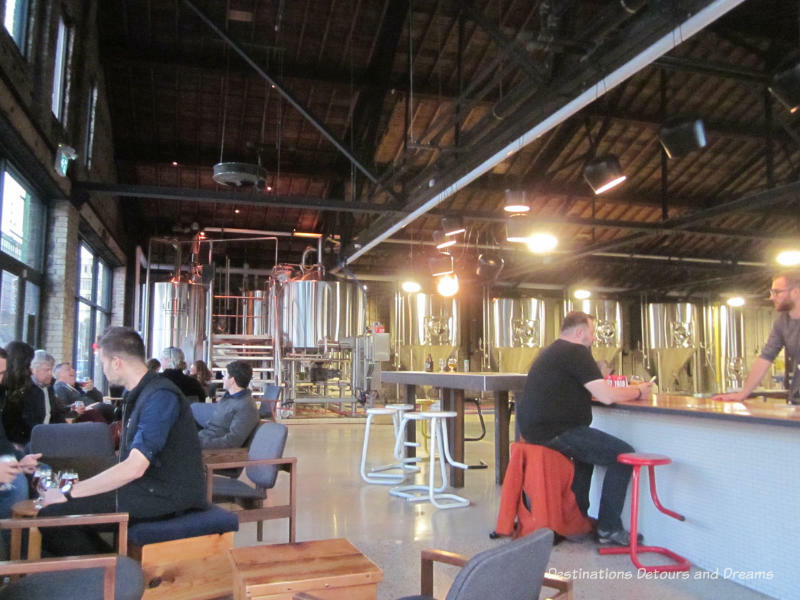 Torque Brewing Co. is located in the St. James industrial area. The brewery is in a separate room and is not visible from the taproom, however the Ale Trail tour included a tour of the brewery. 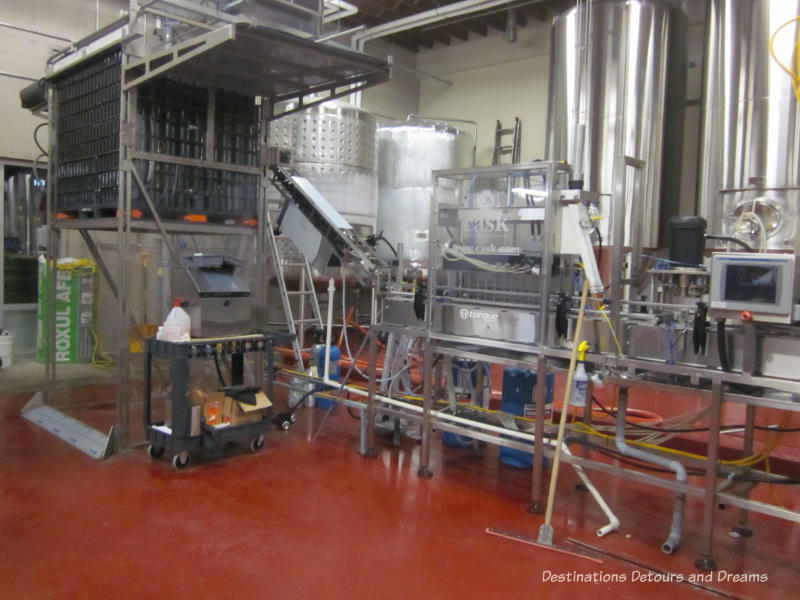 The tour went through the brewing process from creating the wort to the canning process. This was not the first brewery tour I’d been on, but still I learned new things. I was particularly interested in the timing of the hops, perhaps because it related to the tasting lesson we’d just had. Hops for bittering are added in the last hour of the wort boil. Flavouring hops are added in the last 15 to 30 minutes. Hops responsible for the aroma are added in the last five minutes. It is the specific combination of hops that gives the beer its distinctive flavour. In addition to filling kegs to serve beer on tap, Torque cans beer for wider distribution. They use plain black cans for all beers and attach labels to identify the specific beer. After our tour, we sampled a flight of four Torque core pours. What the Helles is a German pale lager. It is extremely clear because it sits in the filtering tank for an additional month. It is their most popular beer and was also my personal favourite. The Witty Belgian is a wheat beer. Red Line is an American style red IPA and a 2017 Canadian Brewing Awards Bronze Medal winner. Diesel Fitter is an American stout that I thought had a bit of a coffee flavour. Torque Brewing taproom is open Tuesdays and Wednesdays from 2 pm to 9 pm, and Fridays and Saturdays from noon to 11 pm. They do not serve food, but popcorn is available from a theatre-style popcorn machine. Other snacks, like bags of potato chips and (believe it or not) beer-flavoured fudge, can be purchased. They hold comedy and music event nights. 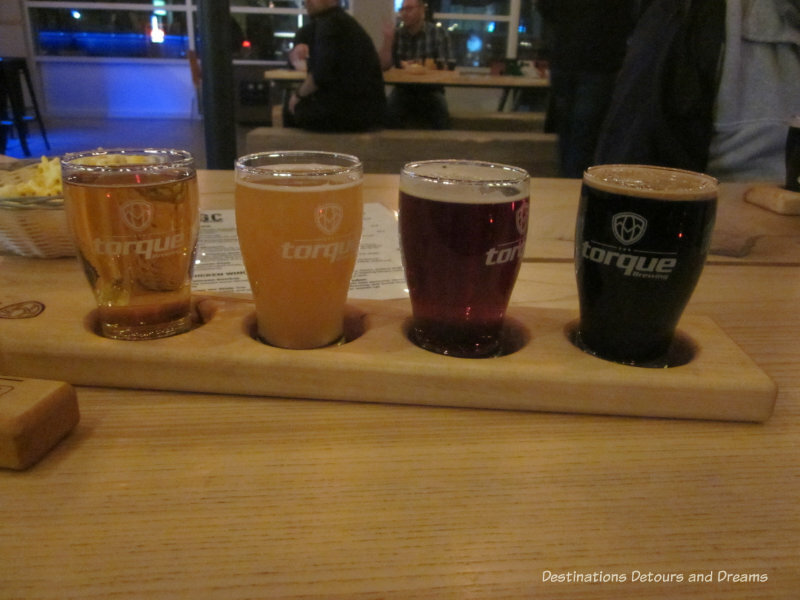 Torque makes seasonal brews and special small batches in addition to their core brews. The beer is available in Manitoba liquor stores and cold beer vendors and is on tap in several bars and restaurants in the province. 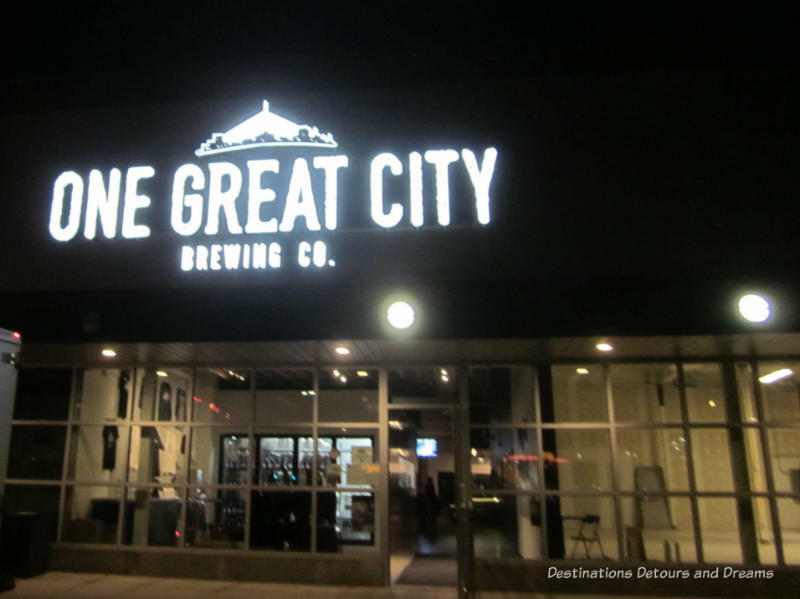 One Great City Brewing Company is located in Madison Square near Polo Park. It is a restaurant and a brewery that takes its name from a former Winnipeg city motto. The restaurant and brewery are separated with over three hundred feet of glass so customers can see inside the brewery from every table. The menu includes snacks, sandwiches, salad, chicken wings, burgers, and meals of steak, lamb, fish, chicken, or ribs. I cannot speak to the rest of the menu, but the beer cheese soup I had was delicious and creamy, with a hint of mustard. 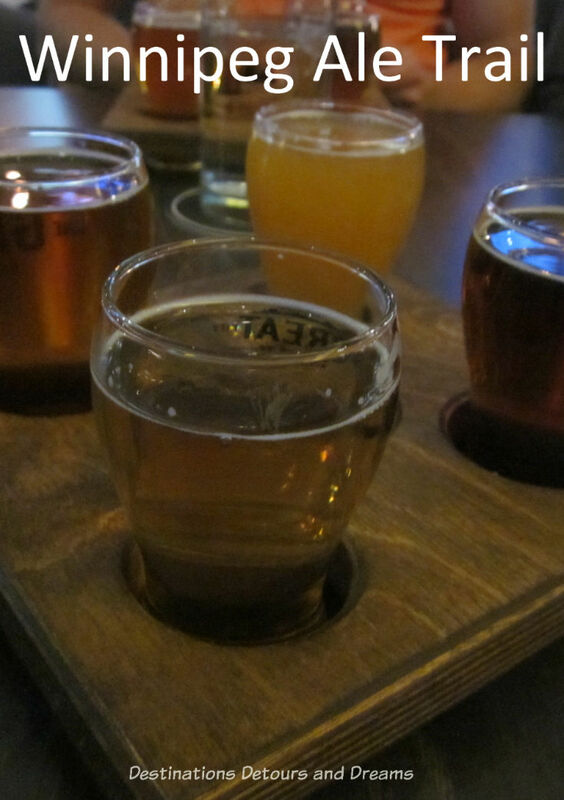 The sampler flight included an American blonde ale, a Belgian wheat beer, an IPA, and a milk stout. The IPA was my personal favourite. They also make an extra special bitter which I did not get to sample on this visit. I am a fan of English pub ales and plan to try that on my next visit. 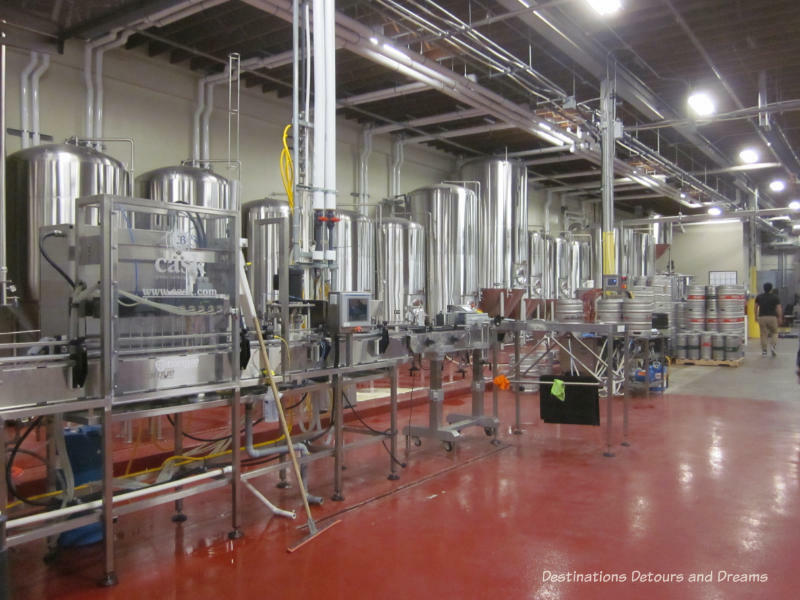 I visited these breweries via a tour offered by Winnipeg Trolley Company. Their tours run July through October. During the ride from brewery to brewery, the guide entertained us with Winnipeg history and beer stories. Another company offering beer tours in Winnipeg is Winnipeg Tasting Tours. Of course, you can also visit on your own without being part of any tour. I’m not a beer fan, but I’m glad Winnipeg is finally getting in on the craft brewery scene. That beer soup sounds yummy! Deb, the soup was yummy. I’m surprised at how quickly the craft brewery scene is growing here. I’ve never been one to swill and sniff my beer before I drink it. But that aside, I’d be happy to hop onto this tour. Ken, I’ve never swirled and sniffed my beer before either. It was certainly a fun tour. I tend to like red wine all year around, scotch in the winter and a good wheat beer in the summer. 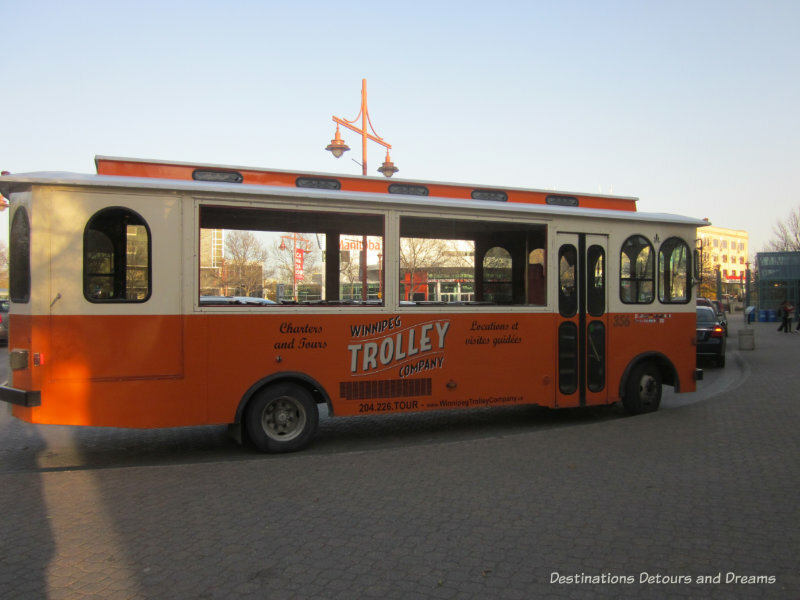 This tour would appeal to me–a trolley, a tasting, oh yep! Rose Mary, I like red wine too. I’ve never developed a taste for scotch I prefer malted barley beers to wheat beers, but it is always fun to taste and try different brews. Fun post, Donna! I love craft beer and have tried many of the ones you mention. But I have not yet taken the Winnipeg Beer Tour. Maybe I’ll have to change that! Doreen, given that the craft beer scene is relatively new to Winnipeg, I suspect the beer tours are also a fairly recent offering. They are a great way to visit a few breweries, learn a bit of the beer and breweries, sample, and not worry about transportation between the breweries. Oh, does that beer cheese soup sound great! The world of craft beers has literally exploded in the last few years which opens up a whole new world for beer aficionados. 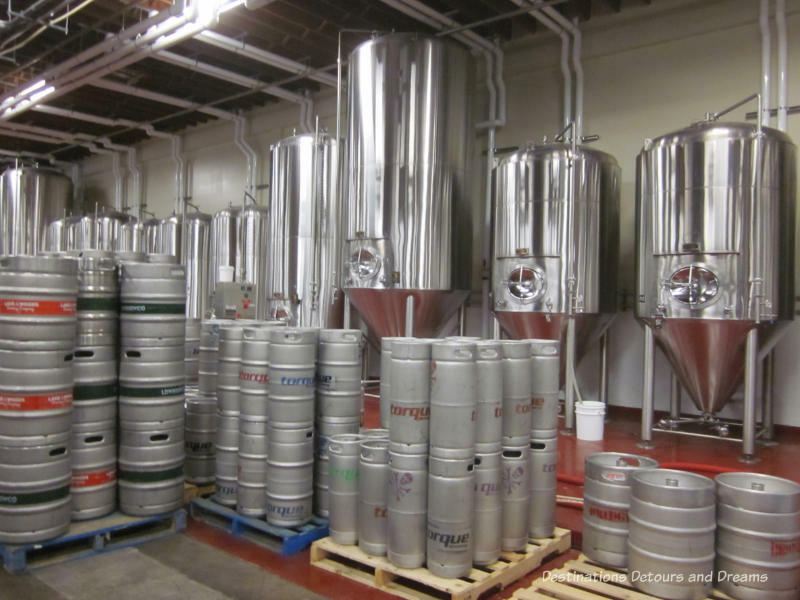 I’d love to go on a brewery tour as there’s so much about the beer brewing business that I know nothing about and the beer tasting would be fun too! Anita, I found the information about the brewing itself fascinating. Visiting breweries can be a lot of fun, even though beer isn’t my favorite. Jeri, my husband doesn’t drink beer either (unless we are in the U.K.). He came along on this tour on the “dry run” option for people who aren’t sampling and enjoyed it. I’d love to visit The Little Brown Jug – especially if I can ride in that fun trolley. The company does a couple of other tours with that trolley in the summer. One is a 90 minute city tour.